First things first, let’s talk timing. PSAT testing for 10th, 11th, and registered 9th graders will begin at 8:30 a.m. and last until 1:20 p.m.
Wednesday will be a late arrival day for 9th grade students who are not registered to take PSAT and 12th grade students. Late arrival for these students will be at 11:30 a.m. If any student is not able to find transportation for late arrival, they can still ride the bus in the morning like normal. All 9th grade students who are not registered to take PSAT and all 10th and 11th grade students that arrived too late to take exam or are not scheduled to take the exam due to extenuating circumstances will report to the Large Gym at 11:30 a.m. for attendance. All 12th grade students will report to Small Gym at 11:30am for attendance. Students who are testing will eat their lunches between noon and 1:20 p.m. in their testing rooms. All students testing are to bring their own lunch. There will be sack lunches available in the morning for any student that is unable to bring their own lunch from home. Lunch for non-testing students will be from 11:30 to 11:50 a.m. followed by assemblies for the 9th and 12th grade classes. From 11:50 a.m. to 12:30 p.m., 9th graders will be in the gym while 12th graders are in the Fine Arts Center for an assembly. After switching locations at 12:30 p.m., the classes will have presentations until 1:20 p.m. Following 1:20 p.m., all students will go to their 3rd period classes. The remainder of the school day has students in 3rd period from 1:24 to 2:09 p.m., then in 2nd period from 2:13 to 2:58 p.m., and finally at 1st period from 3:02 to 3:47 p.m. to end school at the standard time. 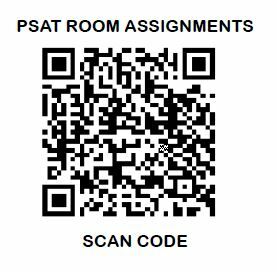 Need some PSAT prep? Check this link from the College Board.